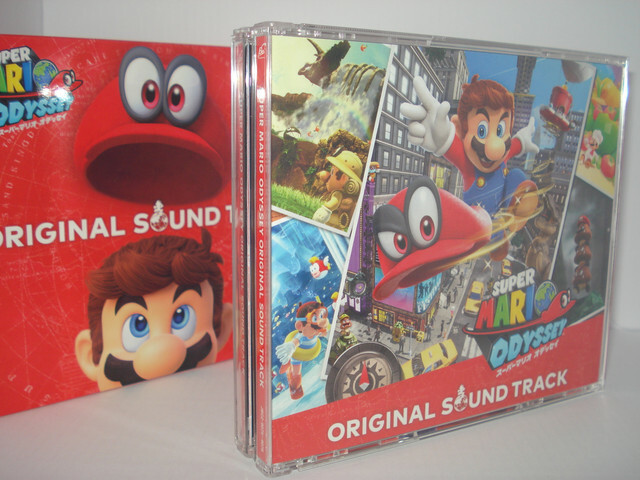 The Original Soundtrack of Super Mario Odyssey has finally arrived. With it, I’m making my first post of this type too. “A look at” posts will be like an unboxing but in high quality pictures instead of video. Like I already mentioned in the title, the first item I’ll be sharing will be official OST of Super Mario Odyssey. First, here’s a look at its box. As you can see, it comes in a nice transparent sleeve and the box itself looks really simple and elegant. When you take it out, you get the real big box of the OST which contains the 4 discs. And now for the inside. Here you can see the first section which includes the first two discs. And here’s the second section which has Disc 3 and Disc 4. By the way, that’s not everything that comes inside the OST. The case also includes two stickers and, of course, a booklet. You can see them below. And now for the inside of the booklet which, obviously, includes a list of all the tracks in each disc. There’s also the lyrics for the songs in the game. Wanted the lyrics to the Japanese versions? Here they are too. Then we get special notes and a few pieces of Pauline artwork. Finally, here’s the last page which are the credits of the soundtrack. And the back cover of the booklet. Back on the case, here’s the art that’s behind disc 1 and disc 4. … and behind disc 4. If you want to get a better look at any of the images, feel free to click on them for the full resolution shots.